Bratislava is the Caipital an the muckle maist ceity o Slovakie. The ceety ligs on the river Danube, ane o the maist important rivers in central an eastren Europe. It is in the sooth-wastren pairt o Slovakie an haes a population o 426,000 fowk (2006). * Nummers in brackets leet the year o twinnin. The first agreement wis signed wi the ceety o Perugia, Umbrie in Italy on Julie 18, 1962. 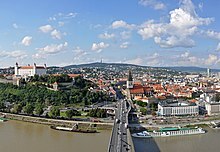 ↑ "Bratislava City – Twin Towns". Bratislava-City.sk. 2003–2008. Retrieved 2008-10-26. Wikimedia Commons haes media relatit tae Bratislava. This page wis last eeditit on 17 Apryle 2017, at 00:03.